We have experience removing paint containing lead safely. TMI completes all work in accordance with OSHA 1926.62 and TMI’s Lead Removal Compliance Plan. TMI’s field crews are confined space trained. TMI Coatings has completed numerous silo lining projects for Bimbo Bakeries nationwide including Rockwall, TX; Meridian, MS; Oklahoma City, OK; and Houston, TX. The integrity of the protective coatings in the silos is of utmost importance at the bakery since it comes into direct contact with food. Any chipping or flaking of the coating can cause concerns over product contamination, so it is imperative that the silo interiors are well-maintained. SP10 Near White Metal Blast to remove the existing lining and create an anchor pattern for new coating adhesion. All welds and sharp edges received a stripe coat of the low odor, USDA-approved high-solids epoxy. Then two additional coats of the high solids epoxy were applied. 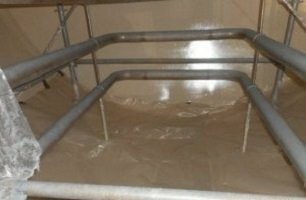 This epoxy lining allows for slip and release and is chemical and abrasion-resistant making it ideal for use in silo interiors. The silo lining will cure in 7 days at 77° F; but for some of the facilities where temperatures were not expected to rise to 77° F or where production could not be stopped for any extra week, TMI force cured the silo lining. Force curing the silo lining allows for quicker return to service. Instead of 7 days, the force cure schedule allows the silo to be returned to service 72 hours after the coating is applied. The project at Bimbo Bakeries in Houston, TX was unique in that TMI not only lined the interior of three flour silos, but also waterproofed the baghouses on top of the silos. Years of ponding water accumulating in the baghouse had left the floors heavily corroded, pitted, and with potential pinholes that would allow water to contaminate the dry goods below. TMI sandblasted the baghouses to reveal the extent of damage so repairs could be assessed. 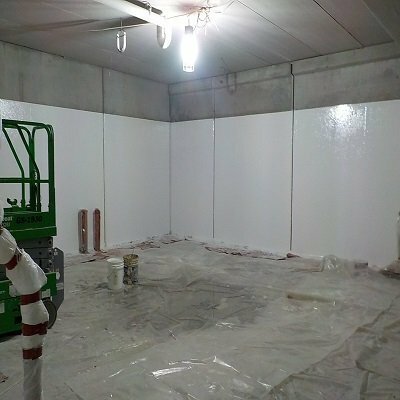 After welding repairs were completed, TMI installed a waterproof urethane elastomer protective coating to the baghouse floor and up the wall-floor juncture. Urethane elastomer provides corrosion protection; it expands, and contracts therefore will not crack, chip, or peel due to temperature changes. It can withstand constant ponding without promoting mold and mildew growth. Because workers need to walk around the baghouses, aggregate was incorporated for a non-slip finish. Now the baghouses are properly protected from further extensive corrosion with the waterproof urethane elastomer coating, and the silo interiors below are re-lined with the food-grade approved epoxy coating. Our project contact, Jasmine Hudson, was happy with the work TMI completed. She said it was great working with TMI and that she would recommend us to others.